Home of hand-crafted British Wool and Harris Tweed. Roses Workshop is a one woman cottage industry keeping traditional skills alive and specialising in British Wool including Shetland, Jacobs, Herdwick and Manx Loaghtan. My range of beautiful designs include stylish handknit Fairisle hats, stunning handwoven Harris Tweed bags and cushions, and fun felted ornaments. Harris Tweed is a very special fabric. It is the world’s only commercially produced handwoven tweed. The Harris Tweed Orb symbol certifies the cloth is genuine Harris Tweed: "Handwoven by the islanders at their homes in the Outer Hebrides, finished in the Outer Hebrides, and made from pure virgin wool dyed and spun in the Outer Hebrides." 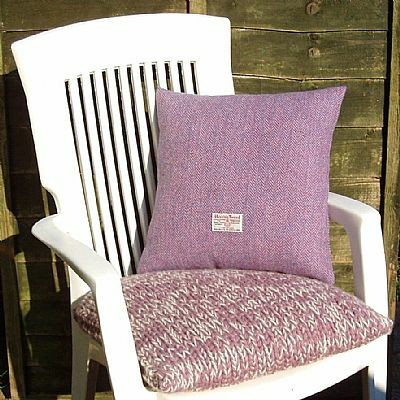 I love working with this beautiful quality fabric, and you will find many Harris Tweed items in my shop. Please explore the menu on the left to find items available on my online Shop, now split into departments for Harris tweed, British Wool, etc. If you would like something special made to order please use the Contact form. To find where my items are for sale elsewhere check the Events page - I look forward to meeting you in person!